Two of Osama bin Laden's closest associates -- Ayman al-Zawahiri and Muhammad Atef -- are Egyptians with strong ties to Egyptian Islamic Jihad (EIJ), the radical group behind the 1981 killing of Egyptian president Anwar el-Sadat. (According to recent intelligence reports, Atef also plotted details of the 1998 African embassy bombings and the Sept. 11 U.S. attacks.) In 1998, bin Laden's Al Qaeda organization and EIJ announced that they were merging to form the World Islamic Front for Fighting Crusaders and Jews. Here, FRONTLINE's interviews and background readings explore the Egyptian origins of Islamic extremism and how, over the decades, events and forces in Egypt have shaped the minds and motivations of today's terrorists. Egypt's ambassador to the United States discusses in this interview how Egypt successfully cracked down on its own internal Islamist terrorism and defends the tactics that were used. He also talks about what fuels anti-Americanism in the Middle East. This interview was conducted mid-September 2001. For 20 years he headed Egypt's security service. Following Anwar el-Sadat's assassination in 1981, General Allam and the new president, Hosni Mubarak, waged a campaign against radical Islam not seen since the days of former President Gamal Abdel Nasser in the 1950s and 1960s. It included unlawful arrest, detention without trial, and torture to force confessions. Thousands of suspected terrorists were rounded up and jailed, among them Sheik Omar Abdel Rahman, who was later convicted of conspiring to blow up New York City landmarks, and Ayman al-Zawahiri, one of bin Laden's two top lieutenants. This interview was conducted mid-September 2001. He is an Egyptian-born U.S. citizen. Like many disaffected Egyptian middle-class students, Sattar was attracted to the views of Sheik Omar Abdel Rahman, who preached that the only way to establish an Islamic state in Egypt was through a massive armed struggle, or jihad. Sattar later became a close aide to Sheik Abdel Rahman, who was convicted of plotting terrorist attacks in the U.S. Sattar explains why many in the Islamic world agree with bin Laden and oppose the U.S. -- either violently or peacefully. Sattar also answers questions about bin Laden's Egyptian allies. This interview was conducted in 1999 for FRONTLINE's report "Hunting bin Laden." An Egyptian dissident based in London, el-Sirri is the director of the Islamic Observation Center. In 1994 he was sentenced in absentia to death for his involvement in a failed assassination attempt on former Egyptian Prime Minister Atef Sedki which killed a young girl. He denies the charges. Calling the Egyptian regime "dictatorial," he says change can only come through a military coup or popular uprising. He also talks about bin Laden's top lieutenant Ayman al-Zawahiri. This interview was conducted through a translator in September 2001. "Islam didn't produce Mohamed Atta," writes Fouad Ajami in The New York Times Magazine (Oct. 7, 2001). "He was born of his country's struggle to reconcile modernity with tradition." "U.S. Has a Long Way to Go To Bring Around Egyptians"
"Mahamoud Bahi Radwan, the principal, held court behind his battered wooden desk at Mustafa Kamal Middle School on Monday, urging teachers seated on plastic chairs in his cramped office to discuss Egypt joining the battle against the forces who carried out what he called 'the slap.'" From The New York Times, Sept. 26, 2001. In this June 2001 interview with Al-Ahram Weekly, the departing U.S. ambassador to Egypt, Daniel Kurtzler, reflects on tensions in the U.S.-Egyptian relationship, including differences regarding Iraq, the conflict between Israel and the Palestinians, and the October 1999 EgyptAir crash. "Egypt: Stable, but for How Long?" This article from the Autumn 2000 issue of The Washington Quarterly traces the history of the Egyptian government's historical reactions to surges in political Islam, and questions the ability of Hosni Mubarak's autocratic regime to withstand serious social and/or economic instability. 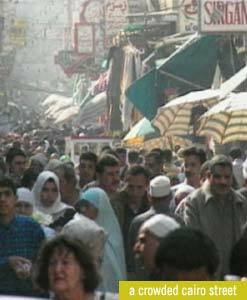 In this February 1999 interview with Atlantic Unbound, New Yorker staff writer Mary Anne Weaver discusses her book A Portrait of Egypt: A Journey Through the World of Militant Islam (Farrar, Straus & Giroux, 1998). "There is a growing concern," she says, "that if Egypt 'goes Islamic,' so could much of the Arab world. Egypt is the most populous and the most influential Arab state, and since the 1970s the Islamists there -- with growing vigor, in growing numbers, with growing support -- have infiltrated the courts, the universities, the schools, the arts. A number of preeminent Egyptian thinkers and ideologues are quite convinced that an Islamic victory in Egypt is inevitable." "Sadat and His Legacy: Egypt and the World, 1977-1997"
This introduction by Jon B. Alterman offers historical background on the rise of the slain Egyptian president. It describes Sadat's legacy as a series of ongoing processes -- particularly Egypt's role in the Arab-Israeli peace process in the aftermath of the 1978 Camp David accord. "Egypt: Country Reports on Human Rights Practices, 2000"
This U.S. State Department report cites Egyptian human rights practices as "improving," largely due to the decline of terrorist activity by Islamic extremists. However, it calls the government's record in relation to freedom of expression and treatment of detainees "poor." It writes that "the dominant role of the President and the entrenched [National Democratic Party] control the political scene to such an extent that citizens do not have a meaningful ability to change their Government." A profile of the radical Egyptian group Islamic Jihad from the International Policy Institute for Counter-Terrorism. It includes a history of the organization, news analyses, and a chronology of their attacks from 1988-2000. A profile of the radical Egyptian group Al-Gama'a al-Islamiyyah (the Islamic Group) from the International Policy Institute for Counter-Terrorism. It includes a history of the organization, news analyses, and a chronology of their attacks from 1988-2000. "The Islamic State in Egypt is Approaching"
In this 1997 interview with Nida'ul Islam magazine, Al-Gama'a al-Islamiyyah representative Sheik Rifa'ey Ahmad Taha describes the organization's aims of creating an Islamic state. He predicts that upon its establishment, "Indeed, Israel will confront us at that time, and America will besiege us, and the West will boycott us, in fact the entire world will attack us as one."